← What do the Knapps and the last empress of Russia have in common? 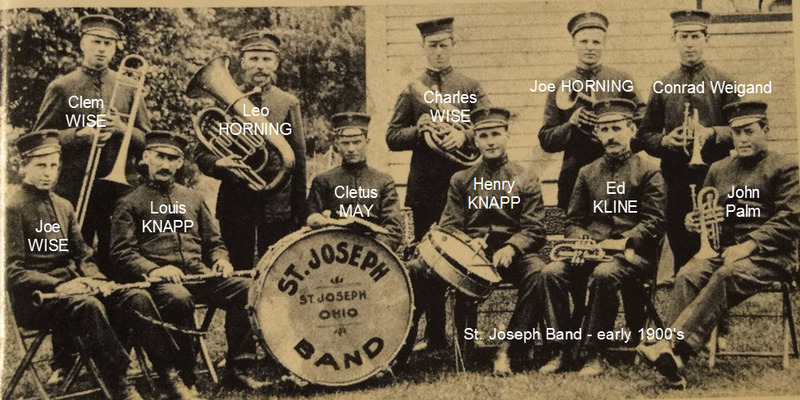 Pictured at left is a photo of the St. Joseph Band, taken in the early 1900’s. You can click on the photo to see an enlarged version – which I recommend if you wish to read the annotations listing the names of the band members. One of the band members shown, the dapper-looking fellow with the mustache, who is seated second from the left in the first row and is holding a clarinet, is identified in the picture as Louis KNAPP. However, I believe him to be Lewis Joseph KNAPP, my husband’s great-grandfather and father of John Lewis KNAPP. It is interesting to note that almost all of the band members, with the exception of two, are probably related to the KNAPP-KLINE clan in some fashion. Only Conrad Weigand and John Palm are not related to either a KNAPP or a KLINE – at least as far as I know. This photo is featured on the front cover of a book entitled, Randolph, Atwater & Rootstown Revisited: Includes New Milford & St. Joseph, published in 2000 by Heritage Publications of Brady Lake, Ohio. This company published a series of books about local history, featuring great photos and interesting articles about surrounding communities in Portage County, Ohio. During the next few weeks, I will try to figure out what happened to each of these gentlemen – and share their stories with you. I will also explain exactly how they are related to the KNAPP-KLINE clan (if they are related). It will be interesting to see what kind of surprises may turn up – so stay tuned! This entry was posted in Family History, Horning, Kline/Cline/Klein, Knapp, Local History, May, Photos, Portage County, Wise and tagged Horning, Kline, Knapp, May, St. Joseph Band, Wise. Bookmark the permalink. I have a Conrad Weigand b 1894 in Dover, Tuscarawas, OH living in Suffield during the 1910 census. I have him living in Barberton, Summit Co. in 1917. His father was John Frederick Weigand b 1868 who is in the Suffield census from 1910-1940 and is buried at St. Joseph in Randolph. Conrad’s sister Agnes was married to Robert Klein b 1906. Every man in the picture except John Palm show up in my family database! My main family is Schaefer with grandmothers, Schrader, Griggy, Conner, Weigand, Rothermel. Gwen: Thank you for providing more information about Conrad Weigand! The Griggy line is known to me, since my husband’s uncle married a Griggy. And I believe we have some Rothermel connections as well.